This species is accepted, and its native range is Hainan to N. Vietnam. Herbs, medium sized to rather small, evergreen. Stem short, epigeal. 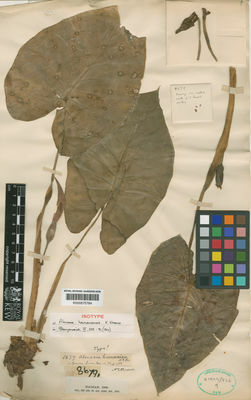 Leaves few together; petiole 28–32 × ca. 1cm, slender, sheathing to ca. 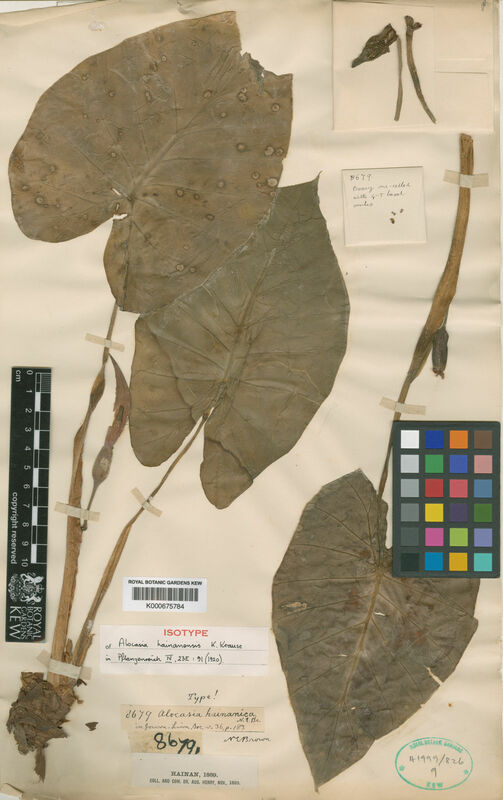 1/2 length; leaf blade weakly peltate, ovate-sagittate, ca. 25 × 13cm, thinly membranous, apex acute; posterior lobes ovate-oblong, 8–10 × ca. 5cm; lateral veins 4 or 5 on each side. Inflorescences solitary; peduncle cylindric, slender, ca. 18cm × 4–5mm. Spathe ca. 6.5cm, weakly constricted; tube narrowly ovoid, ca. 15 × 8mm, glaucous; limb erect, narrowly oblong, ca. 5 × 2cm, apex long acuminate. Spadix slightly shorter than spathe; female zone cylindric, 1–1.2cm; pistil ovoid; style short; stigma ± 3- or 4-lobed; sterile zone narrowly cylindric, 6–7cm × ca. 2mm; synandrodes depressed, rhombic-hexagonal in outline, ca. 2 × 2.5mm; male zone ca. 15 × 5mm; synandria comprised of 6 stamens, rhombic-hexagonal, ca. 2 × 2mm; appendix narrowly conic, ca. 1.1 × 0.3–0.4cm, acute. Infructescence and fruit unknown.